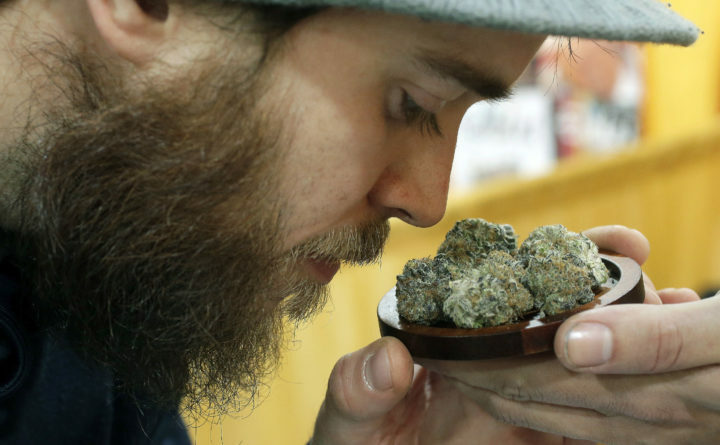 Julian Clark of Westerly, Rhode Island, smells a strain of marijuana flowers called "Cookie Pebbles" at a trade show in Worcester, Massachusetts, Dec. 17, 2017. We can sum up the year with three “L” words: legalization, legitimization and listings. — Legalization of medical marijuana has spread well beyond Canada to places like Thailand and the U.K. that few people saw coming. — Legitimization of the drug has gathered pace at an astonishing speed, with traditional consumer and pharmaceutical companies ranging from Constellation Brands and Anheuser-Busch InBev, to Altria Group and Novartis investing in or partnering with pot firms. — The number of cannabis listings has soared, with at least 149 companies worth a combined C$54.7 billion trading on Canadian stock exchanges as of Jan. 2. A growing number of those are U.S. firms with market values above C$1 billion. — The U.S. will dominate the news flow and stock listings: with the recently passed farm bill legalizing hemp, some say it’s only a matter of time before legislators follow suit and legalize cannabis nationwide. Others argue a divided Congress will stymie any real progress. Either way, 2019 will be America’s time in the marijuana spotlight as investor interest rapidly shifts from Canada to the much larger U.S. market, where consumer spending on legal cannabis is expected to reach $20.9 billion by 2021 from $11 billion last year, according to Arcview Market Research and BDS Analytics. — As the U.S. weighs proposed legislation that could open up banking and stock exchanges to cannabis companies, institutional investors will feel increasingly comfortable investing in the space. To date, cannabis investments have largely been the purview of retail investors, family offices and specialty hedge funds. — Legalization of both medical and recreational cannabis will continue to spread around the world, with France, Italy, Peru, New Zealand and even Lebanon on the list of countries thought to be the next movers. — Clear winners and losers will begin to emerge in Canada as pot producers report their first earnings that include recreational sales. Expect plenty of consolidation and a few outright failures.